This is the paper that started it all, so to speak, in 1998. It's proved pretty durable, advancing a view that more than decade later (2011) was fresh enough to be [echoed in a TED Talk] program and more recently (2016) informing and extending some leading edge stories coming out of the Agile software development community. This page is LONG. What might seem obvious now needed some sneaking up on 20 years ago. It was originally written as the heart of a larger collection of papers, [The Inviting Organization: Evolution is Now and Open Space] so there might be a few stray references to that along the way. That collection has now evolved through eleven editions of my Open Space Training and Practice Guide. This page is being updated in August, 2016 (the 2002 addendum has been rolled into the main story and some new connections to Agile software development are still being refined, in a Field Report 2016 section, at the end). The city of Fairbanks lies near the center of the immense piece of territory that is the great state of Alaska. If you head out of town the wrong way, especially at night, you can drive a very long way before you discover your error – hopefully while you still have enough fuel to get back. Years ago, after dinner at the home of a client, a few of us visitors headed back to our lodgings together. Our driver, a careful sort of Bostonian, refused to leave our host's driveway until we'd located the correct map. Easier said than done. The car was littered with maps, to this place and the other, that people had been drawing for him all week. By the time we did finally locate the one that would lead to our lodgings, all of the windows were heavily fogged. It was the middle of April, thirty-three degrees, and midnight. The ground still buried in snow, the sky black like crazy, not one shred of a moon. A steady rain was turning to snow and the roads were turning to ice. With the windows still fogged, our driver eased back out of the driveway and idled slowly up the street, defroster blazing and blowing. The fog cleared quickly, everywhere except right in front of our driver, who began fiddling with the defroster in frustration. "I can't see where I'm going!" he complained. I looked over at my friend Chris and buckled my seatbelt. Then I looked at the windshield and laughed, "Well, actually," I said, "you can see where you are going OR you can see where you are going... And since the map is not the territory, why don't you give ME the map and YOU stick to the territory." Leaning over, I snatched the map from the dashboard, clearing the defroster vent, and the window quickly cleared. I tossed the map on the seat and we headed out into the vast Alaskan night. Maps are important for two reasons. First, they give us the comfort we need to get out of the driveway and on our way. Then, they sit there on the seat until such time as we might need them to reorient ourselves in suddenly unfamiliar territory. 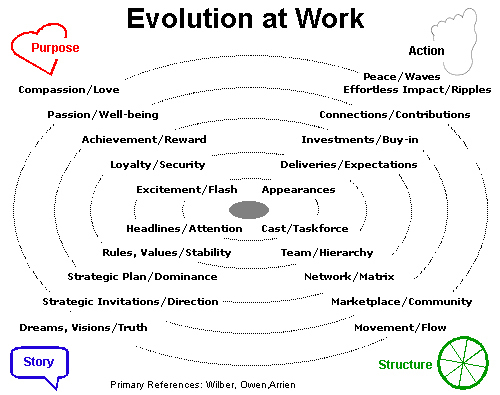 The "circles and arrows" map shared here, this rough sketch of evolution in organization, works the same way. It gives us some comfort as we set out into Open Space [or Agile software development] and it helps us re-orient and understand what is going on, once we're out there in the territory. For years we've been exploring the edges of the territory beyond command and control, often wondering if anyone is really in command and feeling rather out of control. In some business organizations, we've come as far as 'the learning organization' -- supposedly able to educate and re-educate itself -- but as often as not this shows up as preach and teach, plan and sell, ask then tell -- all watered-down versions of command and control. The literal meaning of 'education,' however, is 'to draw out' -- which starts to sound a lot like invitation to me. And as command and control continue to slip away -- into the vast open space of global business, international politics, and worldwide uncertainty -- the bad news is that invitation may very well be all that we have left. The good news, however, is that it may be all that we need. The same can be said about Open Space Technology. What follows is a personal, professional, and practical story of the inviting organization -- and how it is emerging in the territory of Open Space. [Most recently, in 2016, in Agile software development, we see what may well be the confirmation of what this map suggests comes after that]. For me, Open Space Technology is more than a facilitation technique; not just another trick in my bag. I came into it from a background in business finance (healthcare finance and leasing) and experiential education (wilderness/adventure with outward bound schools). As a facilitator of team learning and experiential teambuilding activities, I immediately saw Open Space as a way to make the 'real work' the teambuilding initiative. Forget the ropes, blindfolds, metaphorical framings, color-coded t-shirts and the coffee mugs emblazoned with gung-ho, all-together-now cliches. Open Space Tech was a simple, powerful way to walk into any size of group or organization, focus attention on the most important business issues, and invite everyone to learn and contribute as much as they could to their successful resolution. For me, it eclipsed the need for teambuilding altogether and made organization-building a practical, powerful reality. About the same time I discovered Open Space Technology, I came to understand that I was most productive, most effective and most happy on those projects where clients had called to invite me into their work, rather than because I had called them and sold a project. Seeing this, I resolved to make invitation the central focus of my personal and professional practice. I practiced listening for invitations -- from the little intuitive pulls we all get to the more explicit "why don't you come to Philadelphia with me... we could co-present at this conference there!" It quickly became clear that invitations come to those who also invite, so I practiced this as well. Open Space Technology was essential in this practice, as it allowed me to invite everyone (literally) in my personal and professional circles into conversation and action on the issues and questions most important to me. even when we didn't have enough time in these gatherings to do formal action planning, it was clear that everyone present had been touched, moved, changed by our time together. How then, could they not act differently going forward? Indeed, in these times of rapid, even swirling change -- with complexity, urgency, diversity and the potential for conflict already high (and still on the rise) -- making sense, making meaning, making conversation qualifies as real work and creates real value. Invitations raise the awareness, speak the truth, gather the resources needed to get real results. invitations communicate intention, even to those who won't or can't be present. invitations offer new language for describing the truth of what's happening. Invitations get people moving in the same direction, at the same time -- because those people WANT to move that way. In this way, invitations turn managers into leaders, and invitees into managers. If we see Open Space Tech as one way to practice the leadership art of invitation, is it any wonder that this technique has produced phenomenal results all over the world? When all else fails, it seems clear that everyone still works better and happier when they are invited into their work. For me, the power of Open Space lies in its ability to invite invitation throughout an organization or community. It starts, simply enough, with one invitation extended by an individual or small group, to everyone and anyone they think will learn from and contribute to breakthrough progress on an important issue or set of issues. This invitation touches everyone who receives it and begins to inform their work. Those who choose to accept the invitation and attend the meeting are invited to post their own invitations to breakout sessions. This gives the original invitation a new level of detail and sets up the next conversations. After each breakout conversation, the participants document their conclusions and next intentions. The issues raised in these proceedings are clustered and prioritized, creating the next degree of detail, next set of invitations, and next round of working conversations. And in every conversation, participants automatically invite each other to see more, say more, and do more. Every round brings more people, more understanding, more alignment, and more action -- toward leadership and action everywhere. An inviting story, for sure, but how do we DO it? The answer, it turns out, is deceptively simple. First, name your issue and say something about why you think it matters. Second, make a list of "guests" which includes everyone you need to REALLY deal with the situation at hand. Third, get a time, a space and some materials, including such technical items as an empty wall, chairs, markers, masking tape, and perhaps a few computers if you want to be fancy. Fourth, prepare for the care and feeding of the success story that you will create during this meeting. This might include plans to distribute proceedings copies, create a website, allocate funding, meet with senior managers, or hold followup meetings -- whatever it will take to keep this work moving forward. Summarize all of this in a crisp, clear and creative way and send it out -- and always, always, always -- be prepared to be surprised. Which is to say, try not to get your heart set on specific outcomes or solutions that are almost certain to be less than what the inspired creativity of your group will produce. Expect them to blow away expectations -- yours and theirs. This actually happens quite often in open space! But, you say, breakthroughs happen all the time without Open Space Technology. And, yes, this is true. But if we look at what is really going on at the time of these breakthroughs, we find a lot of the the same basic conditions that we create naturally and intentionally with Open Space Technology. And at the heart of every breakthrough, large or small, we find people following their hearts, speaking their truth, opening to uncertain outcomes, and working with a spirit of learning, contribution and community. The energy of these people is inviting, without their trying or even noticing, the resources they need to make their breakthrough happen. It's only later on that they create policies, procedures and position papers to defend their gains and later still that their attention turns to strategic plans, whole system change and maximizing shareholder value. Eventually, however, comes burnout, turnover, restructuring, data overload, and a need to create something new in organization -- a need for an intentional return to the best of the old days, without sacrificing shareholder value -- a real need to pull it all, invite it all, together again. This story is about people and organizations coming back together -- beyond learning, through open space, on our way to inspiration, along a path of invitation. After command-and-control, after preach and teach, after plan and sell, after ask then tell, we are discovering the simple power of "post-and-host" -- as in post strategic invitations and host strategic conversations. And in the open space beyond the learning organization, a new kind of organization is emerging -- the inviting organization, where inviting leadership literally calls us to the work we really want to do AND manages the work to be done, very literally, practically and effectively, by the issuing of open invitations. As we continue to shift from hierarchical monologue through planning dialogue to dynamic and diverse multilogue, everyone is invited to contribute and every voice matters. In line with this emerging multilogue, this story is really a collection of stories. My intention is not to make them into MY story. Indeed, even the parts of this story that I have penned myself aren't really mine, as they merely echo and extend the work of so many others. My point, then, is that these stories, each one finished and whole in its own right, are OURS. My intention is to pull them into OUR conversation about who we are and where we're going next -- NOT to pull them into my story, or worse yet, my argument for how things should be. My hope is that these stories -- old and new, science and religion, workplace and community, metaphor and checklist, each and all -- when taken together, will give us fresh insights and new languages for working together in the open space, the grand uncertainty, the creative chaos, the passion bounded by responsibility and the spirited universe that we all already know as life. This is the view that I come back to again and again, to help me appreciate where we've been as people and organizations, help me remember why I do the work I do, and help me understand how I can do my work in easier alignment with what is now emerging all around the world. And now, even as all of this is starting to sink in and flow together for us, the organization of our world seems to be dissolving. We used to call it transition, as if it would all blow over. When it lingered on, we started calling it transformation and prepared ourselves for long-term consulting fees. Now, as we look back at where we've been, we can see that it's been evolution all along -- and we're beginning to see the real possibility of doing it more simply, more quickly and more intentionally. This is the story of evolution at work -- and the emergence of inviting organization. It's the integration of a dozen or so years of professional study and personal practice in organization -- crunching numbers, building teams, redesigning process, reading, relaxing and opening space. It's an analytical mapping of the old, deep stories recounted by anthropologist Angeles Arriens and philosopher Ken Wilber and the modern business stories developed by organization development pioneers Fred and Merrelyn Emery, Open Space Technology originator Harrison Owen, and the new economy gurus at Fast Company magazine. Taken together, it invites a satisfying look back, a hopeful look forward and a practical view of our present, as the inviting organization is emerging in open space. We are surfing the edge of chaos, along crazy waves that curl back on themselves over and over again. Fittingly enough, then, this story of the inviting organiztion is itself one grand invitation. It's an invitation to explore, experiment, experience and encourage others to join us as it all comes back together -- as we all come back together -- in an open space beyond the learning organization, where inviting leaders and inviting organizations are moving faster and easier than ever. Inviting leaders and inviting organizations, doing what they are and being what they do. They are opening, inviting stories. And the being and the doing are one, and everywhere. In 1999, the cover of Fast Company magazine, a leading voice of the so-called 'new economy,' proclaimed "How Digital Is Your Company?" as the next great strategic question. According to their story, business strategy used to be as simple as "What business are you in?" As organizations evolved, "What's your business model?" became the definitive question. Today, it's all about getting digital. These questions matter, they said, because every time we get an evolutionary click from one question to the next, everything throughout the organization needs to evolve together, to answer it. Specifically, they said that organizations need to rethink the "four basics of business" which they named as (1) attracting talent, (2) segmenting and selling customers, (3) using speed, and (4) financing operations. Their newest and greatest strategic question, "How digital are you?" demands a rethinking of how we use information and technology to drive the flow of goods and services. In their story, however, they held up examples like McDonald? 's, Walmart and Intel that were working this digital question 15 years ago. "How old is this story?" is the question that came to my mind -- followed closely by "If this is a 15-year-old strategic question, then what's the NEXT great strategic question? What are the next leading-edge organizations asking now?" At the time this story came out, I was already deep into the work of mapping my own understanding of evolution in organization, with the overlapping stories of first-peoples anthropologist Angeles Arrien, Open Space Technology originator Harrison Owen, organization developers Fred Emery, Merrelyn Emery and Eric Trist, and philosopher Ken Wilber. If these wise people, and the map I was making from their stories, were to be of any use at all, they had better point me to the next great question. 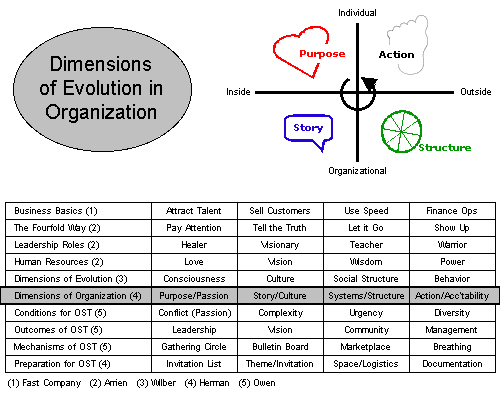 My map was (and is) a four-quadrant, five-stage diagram of evolution in organization. Fast Company's four basics of business mapped quickly and easily into my four quadrants. Their three strategic questions fit perfectly with my first three stages of evolution. And when I looked into my own fourth stage, the next great strategic question, "How inviting is your organization?" was right there waiting for me, jumping up and down begging to be asked. Since then, this evolutionary map has been invaluable in orienting myself to what is going on in all kinds of organizations. Along the way, I've shared it in conversation with clients and colleagues. It's been universally understood and appreciated, even by friends with no training in business or practice in organization. While the map may appear either overly simple or overwhelmingly complex at first glance, the story itself has been easily understood by those who've heard it over the phone and other places where the actual map never was drawn. What follows here is my story of evolution at work. It begins with the story of the map, which pulls together the old stories of spirit and new stories of business and organization. Along the way, the inviting organization will emerge and will be linked to a number of other developments in organization. So it will live in the context of other real stuff, not just in the context of my little map. Finally, we bring Open Space Technology into the picture, noticing its easy alignment and ready support for the emergence of inviting at work. This story starts with the work of philosopher Ken Wilber, who was already being hailed as the greatest American philosopher when he was just 23 years old. He earned this acclaim for his first book, Spectrum of Consciousness. It was the first successfully seamless integration of earthy native spirituality, rational western science and transcendent eastern wisdom. It was also the first of a long line of Wilber writings offering various spins on this same seamless theme. I read his Brief History of Everything first and it got me thinking. Two years later I heard him speak and was moved to read his Marriage of Sense and Soul. Halfway through that second book this picture of evolution in organization exploded into my consciousness. I put down the book and started writing. I started with Wilber's basic two-by-two matrix, a four quadrant map, that has at its core two basic tensions or spectrums of consciousness, shown as intersecting, perpendicular axes. The first axis stretches from inside to outside, subjective to objective. In organizational terms, every organization has a subjective, depends-on-who-you ask, open-to-interpretation and re-interpretation, unmeasurable-but-undeniable, story-based, deeper meaning INSIDE and an objective, observable, measurable, put-it-in-a-powerpoint-pie-chart, pass-it-around-the-room, obviously real OUTSIDE. We use soft, interpersonal skills to deal with the inside stuff of people and culture. We use hard data skills to deal with the outside stuff of decision-making and action. The second axis is equally clear. It runs from the one to the many, the individual to the collective, the personal to the organizational. Every organization exists simultaneously as a single, whole entity AND has many, many individual parts or people. Leadership skills are about the personal, about passion and responsibility, about what do I want and what am I willing to do about it. Strategy is a bigger, organizational form of the same stuff, about culture and decision-making, about where do we want to go and how are we going to get there. together and tell us what is good and bad, right and wrong, sought and avoided. Social structure is the outside, collective, the outside of structure, it's what we literally construct based on our cultural beliefs. Finally, behavior is the individual, outside dimension, the individual actions taken within the social structures, what each of us actually does about the things that we are conscious of and care about. Translating this into more organizational terms, consciousness becomes personal passion or intention. Culture and structure need no translating, as long as we remember that culture is all about story and structure is about how we make decisions and move forward. Finally, behavior becomes action, the bottom lines at any standard cocktail party and any organization... what do you DO? and how do you get people to DO what is required at work? So we really are being pulled in four directions at work, continually reconciling and aligning what I love and care about as an individual with the plans and policies of who WE say we are as a culture, with the decisions, choices and options WE have now in the current organizational structure, with what I am willing to take personal responsibility for DOing about all of it. No wonder we come home tired all the time! If we turn now the wisdom of first-people nations through the ages, as told by Angeles Arrien in her book The Four-Fold Way, the advice we get about this is simple and clear: show up, pay attention to what has heart and meaning, speak your truth, and let it go. In her book, The Fourfold Way, Arriens links these four simple practices with four hero archetypes, four meditations, and four human resources. All of these map easily into the Wilber dimensions. Showing up is the work of the warrior archetype, who practices standing meditation, developing the human resource of power. Map this to individual responsibility and action, where we exercise our individual power to take a stand and be accountable. Paying attention to what has heart and meaning is the work of the healer archetype, whose meditation is lying down and resource is love. Map this to individual purpose and intention, the things we love and in which we rest. Telling the truth is the work of the visionary, who does a sitting meditation and whose resource is vision. Map this to culture, story and planning and vision in organization. And finally, the letting go of the outcome is the work of the teacher, whose meditation is moving, walking and whose resource is wisdom. 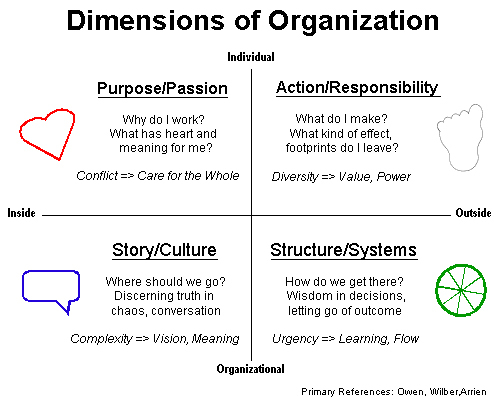 Map this to our capacity to make decisions and move within and beyond the structure of the organization. Returning to the recent Fast Company story that prompted this journey, we can now appreciate just how basic their "four basics of business" really are. Attracting talent is about creating organizations that people can put their hearts into, where they can find a reason to work, something they love and can rest into. Segmenting and going after customers is about creating a vision, a story that customers can literally buy into. Using speed as a competitive advantage is about structuring for movement, letting go of control, and allowing more distributed, front-line decision-making. And finally, financing the operation is about generating power or value through responsibility and action. So far, we've seen that our oldest stories of spirit are aligned with some of our newest stories of business. Now we come to the practice of Open Space Technology, as discovered and disseminated by Harrison Owen. Given his experience in the Peace Corps with the tribes of West Africa, his study of Ken Wilber, his friendship with Angeles Arrien and his deeply practical approach to business of all kinds, it's not surprising that Harrison's contribution to evolution in organization would directly address each of the dimensions of evolution at work AND the challenge of moving in all of them at once. When he looked back on the first handful of years of practicing Open Space Technology, Harrison concluded that Open Space works best when four key conditions are present: when the the tasks to be done are highly complex, when the people who are needed to do them are personally, professionally, or simply geographically diverse, when there is real or potential conflict, and when the decision time was yesterday. Keeping up with our picture then, map the conflict to our first quadrant, as it's just passion in diguise. It just means people care enough to disagree, but not yet enough to hold the larger whole in their hearts. Map high complexity to the absence of vision, as we don't yet see how we all work together, can't yet see the plan. Map the decision-making lag to questions about whether so-and-so is ready to let go of thus-and-such, the structure's not ready to move. And finally, map the diversity as deviance or differences of opinion as block creative new action and new value, remembering that environmentally and financially, diversification is power. To look at why it works so well when the levels of conflict, complexity, urgency and deviation are high and rising, we have only to look at what it invites people to do. First it invites leaders to invite leadership, from all sides, to sit together as one circle, and to give their attention to this larger whole. Next the big, empty bulletin board wall invites all to speak their truth, write it down, and post it so that others who share the same passions can be found and engaged. Then the open marketplace invites the everyone present to move and move and move again, constantly letting go of groups and ideas, in order to maximize learning (wisdom) and contribution (value). Finally, it is the responsibility of everyone who led a breakout session to document what happened so that the action can continue. What's more, the preparation for any open space event has four requirements: the invitation, the invitation list, the space/time logistics, and a plan for publishing the proceedings. The invitation list is about attracting the necessary talent. The invitation document is the vision that brings them together. The logistical opening of the space and time for meeting give people a chance to let go of regular routines and speeds the flow of work. Finally, the plan for publishing the proceedings takes responsibility for action afterward. In the end, it seems that the practice of opening space naturally addresses the four dimensional challenge of evolution AND the four basics of business. To paraphrase Harrison's own story on this, leadership emerges as passion bounded by responsibility, the vision emerges on the wall, the community moves together in the marketplace and the management is a 'no-brainer,' because the whole thing is sprung from leadership and responsibility. He never designed it to do this, indeed Harrison is the first to say that he didn't design it or create it at all... but discovered it, in the process of trying to make the work of managing one particular conference event amazing AND easy. ...keeping in mind that no map is RIGHT, but that some maps are helpful, we'll tie up these quadrant stories and show how they evolve together, as we resolve bigger and bigger conflicts, see our way through increasing complexity, move faster and easier in organi-zation, and act more and more responsibly in larger, more diverse circles. What follows is a nutshell review of each quadrant and a new story of evolution through five distinct levels which parallel Wilber's continuum from matter to body to mind to soul to spirit. Purpose/Passion?. It seems right enough to start with what we love, what we think we want, why we work, and what we intend to create for ourselves. This is the inside-individual face of organization. It's about consciousness, about paying attention to what has heart and meaning, about resolving the conflicts that arise between what we have and what we want, about why we get up and go to work everyday, and about what organizations must honor and appreciate in order to attract talent in competitve markets. Looking into our map now, we see that the evolutionary journey in this quadrant is about learning to work for higher and higher purposes. In the beginning of our own work lives and the lives of organizations, we work for the excitement of it all. Over time, we might start a family, settle down, and excitement isn't as important as security and stability, to be able to maintain the success we've had at the first level. Once we come to believe that we will not lose the gains we've made, it's easy to shift into a proactive drive for still more reward, and work becomes about reaching the next rung of the ladder. At some point, however, we come to the place of asking ourselves what's really most important to us, what is our deepest passion, what do we really love and how can we do THAT in our work. We give our attention to insight, integrity, the things that pique our curiosity and help us feel healthy and whole. Until finally, we begin to ask how we can do the most service for the most other people, working beyond our own personal passions to a compassion for so many others. I should note here, too, that our movements through these levels, as individuals, organizations and a whole national consciousness is never as strict and mechanical as moving from first grade to second to third. Rather they are a journey like any other learning or practice scale, like our 10K race times, monthly sales, and the stock market. They are some easy milestones against which to mark the movement of what we can think of as the critical mass of our attention to each of the four dimensions. And how big we care, how much we see, how easily we let go, and how responsibly we act -- just like our 10K race time -- moves from day to day, depending on all sorts of circumstances and conditions. We'll see differences, too, between people in the same departments and departments in the same organization. The critical mass of attention in the sales department is likely very different from that of the corporate philanthropy department or employee assistance program. Furthermore, if we say that the latter fall higher on the scale, at a higher stage or level, we need also to note that their work is only made possible by the revenues generated by the sales department. None of the higher levels are sustainable without the infrastructure and foundation provided by the lower levels. This is what Wilber means when he says each level transcends, rises above the one before it, AND embraces, includes, and depends on the work done at the level below. The overall drive is to increase, expand, and transcend, bringing more and more of our individual, departmental and organizational attention and energy to higher and higher levels. This movement happens always and everywhere, trending upward without effort or trying. It's enough just to pay attention. Simply noticing these movements and levels can make our work easier, but making one level better than the next always seems to get in the way. Story/Culture?. Here the challenge is to explain what we see, to clarify where we should go, and develop the stories that help us stay focused and stay together. This is the inside-collective face of organization. It's about culture, about seeing and telling the truth about who we are, about defining simple patterns in times of complexity, and about the work every organization must do to segment and go after the customers it wants to serve. It's about creating a story that customers (and everyone else) can literally buy into and believe in. As evolution continues and complexity rises, the parts start talking to each other and the multilogue breaks out. It's everybody talking to everybody, which doesn't happen very often in most organizations. In the chaos of it all, the strategic plan gives way to the strategic invitation, a story that is simple enough to travel fast and light, to appeal to people's passions, the reasons why they really want to work AND is complex enough to embrace and include the most important issues from the grapevine, the mission statement and the strategic plans. Strategic invitation is the story that leads organization into multilogue, where strategic conversation can move faster than the plan. Beyond this, at the highest level, where the reason we work is compassion for all, the story and vision become dream, a 'translogue in which we seem to be in conversation with the whole organization, as organization, at once... or maybe even something larger. As the challenge with caring is to speak it, the challenge with our talking story is to walk it in our decisions, structures and systems. Structure/Systems?. This is where the vision, reflection and conversation of story and plan emerge as the objective, observable choices and decisions, the stuff that guides real action. This is where we get down to how we're going to get where we've said we want to go, where we develop the structures and systems that support timely and wise decision-making. This is the outside-collective face of organization. It's the sandbox where we build up organization structures and production systems AND where we let them go, tear them down, and open space for what's next. This is where we come up against the dizzying reality that it's ALL moving, where we learn over and over again to go with the bigger, faster flow. The evolution of organization structure and systems (and restructuring and redesigning) begins simply as a circle of friends, colleagues and associates. It's a cast of characters, some of whom may be bigger stars than others, but none of whom really tells the others what to do. As cast, circle, task force, posse, and business start-up we may take our cues from outside directors, sheriffs or financiers, but inside the organization, it's an all for one and one for all kind of game that we play for the excitement and headlines. If we have some success together, however, we turn quickly to those bigger names to secure our future. We pledge our loyalty and submit to more and more monologues about policy and procedures, mission and vision. When we appoint a team leader, hierarchy emerges and in time becomes bureaucracy, where responsibility for outcomes rests not with the workers, but with the managers one or more organizational layers above. And this works for a time, until the pressure for front-line decision-making starts to erode lines of command and the bureaucracy starts to dissolve. We restructure into smaller, faster networked boxes, each one full of numbers and assigned to a person, who sits in a matrix of cubes and reports to a handful of different bosses. Each year or so we reshuffle the boxes, until the whole organization ends up in constant motion, one big organizational to-do list, a veritable marketplace of projects, each its own little cast, circle, posse, task force. The circles are formed by invitation (though some invitations are more open than others), to meet specific business needs, given a budget and/or other resource boundaries, and directed to perform in a way that adds value. This is what we're coming to know as the structure of organization and the way real work gets done. Now look again at the process of Open Space, where the circle is formed by an invitation, based on personal passion, professional interests and business needs, the resources and boundaries are clearly marked and the direction is do whatever you can to maximize your own learning and contribution. Open Space is real work, made faster and easier, in circle and invitation and marketplace. And finally, if our experience in Open Space is any indication, when the marketplace of ideas and issues and projects REALLY starts to move, what emerges as the highest form of organization is movement, an undeniable sense of spirit and hardly any real structure at all. At this highest level, our compassion or concern is for all (all customers, all employees, all people, take your pick). Our story starts to sound like "I have a dream..." and structurally, in the words of folk singer Arlo Guthrie, "They'll call it a movement!" when the flow of work is nothing but flow. And the thing about flow is it comes and it goes, but it CAN be invited, we know. Action/Responsibility?. In the end, however, organizations don't really move, don't really do any work -- people do. We think and talk and build support for what we care about. And then, each of us DOES something. Takes responsibility and takes action. Makes a difference and makes our own unique contribution to the flow of evolution. This is the outside-individual face of organization. It's about unique, individual behavior, about creating value and using diverse abilities to make things different, about what we have to show for ourselves, and where we stand, when our work is done. This is the question of finance, value and contribution -- the footprints we leave on a bottom line and better world. The evolution in this quadrant runs from making different stuff, the proverbial better mousetrap, to making a difference that makes a difference, rippling through everthing. While it's been associated here with diversity, that's really only half-way there, as it is really about uniqueness, the reality that each of us is absolutely unique and the possibility that every single action IS a unique, creative act. This journey begins with making appearances, making points, adding value with bells and whistles, a new look to an old product. It's what makes work exciting, makes headlines. In the beginning, it's about showing up in the right places, but eventually it becomes about showing up at the right time, making deliveries, as promised, time and again, loyal and stable, like it says in the mission statement. Eventually, however, as the business grows, the loyal servants are rewarded. We make them partners, shareholders, give bonuses as rewards, and investments. Everything is done based on expected return, the places we work, the projects we choose, the phone calls we return are all 'calculated' for potential payoff. At some point, however, the luster of marginal gain, or the effort of calculation in the face of rising uncertainty, just doesn't matter anymore, and we begin to do what we REALLY want, without regard to returns. We make offerings, contributions and invitations, true gifts of ourselves and our time. We begin to connect our work to those issues, ideas and opportunities and questions that make us feel curious, passionate, healthy, whole. And in those moments when spirit shows up, it all seems to swirl together, everything really works. We take a personal stand, make waves, a responsible ripple effect, and have an effortless but powerfully positive impact on the people and world around us -- often without even knowing it. In short, at this highest level, we make peace with, and in ourselves as the world. And there you have it, in about twenty nutshells. This is my story of evolution at work, mapped onto the oldest story of human evolution, as integrated and animated by Wilber, from the physics of excitement and matter, through the biology of body, the psychology of mind, the theology of soul, finally arriving at the mysticism of spirit. Drawing on Wilber, Harrison Owen has developed his own story of the evolution of organization and leaders, based on his own personal experience in organization and Open Space. That story begins with the reactive organization, defined by the reptilean instinct of killing and eating whatever moves. The leader here is the pioneer, the entrepreneur. Next comes the responsive organization, customer-focused, aiming to please, and as reassuring as a good English pub, but don't mess with the bartender. The proactive organization comes next, characterized by an insatiable need to measure and analyze everything, led by the MBA. In Harrison's story, the interactive organization is emerging now, characterized by the energy of a good coffee break and the action of surfing, and leadership that is 'everybody.' This is, of course, just what Open Space looks like. And finally, the highest realm of organizational life, says Owen, is the inspired or inspirited organization. He is quick to add that while he's seen it show up often, he's never seen anyone sustain this highest level of organization, where leadership is invisible, it's nobody, or at least it's nobody we can see. Coming at this from a more academic direction, Fred and Merrelyn Emery have studied what they describe as four kinds of organizational environments. The first level is 'random,' where the goodies and badies come randomly and can't be predicted. That's why we have to be reptilean and reactive, per Owen, at this level. Next comes 'clustered,' where patterns emerge and learning and planning become possible. Then, they say, one group is eating into a pile of goodies and discovers another group eating into it from the other side. They call this environment 'competitive' and 'disturbed,' because the competition continually disturbs our well-laid plans. Next comes the 'turbulent/adaptive' stage, a state where the disturbances have resolved into permanent whitewater and continuous adaptation becomes essential for survival. Finally, they hypothesize that there is actually a fifth level. They could sense it, but could never study it formally because, like Owen's inspirited level, it can't be sustained long enough to document. They call this level vortical, as in vortex, which fits perfectly with our experience in Open Space and elsewhere. When spirit runs high in a workgroup, as it does so often in Open Space meetings, participants often report having planned to or even tried to leave, "but something kept sucking me back in." The energetic pull of inspiring work seems consistent with the physical sucking of the vortical (swirling, whirlpool) environment in the Emery story. While it's important to note that their research and analysis did identify distinct ideals, strategies, planning scopes and operating skills required to survive in each of the first four environments, we'll save those details for another day. A more playful extension of this story, however, and one that might help this map sink a bit deeper in memory, is something I call the Seattle Stories. This is really a simple, five-stage history of the Seattle region, which has participated in every major wave of American economic development. The first wave was timber, led by Weyerhauser, an exciting, pioneering sort of business, gathering the raw materials (matter) that were the building blocks of the rest of business life. Next, came Boeing, literally in the business of manufacturing stable, secure bodies that make deliveries and are operating by chiefs who make monologues over loud speakers like CEOs on the company-wide conference call. In the information age there is Microsoft, a company that may have invented stock option incentive plans, has networked us all, and made us all a little out of our minds. Next comes free-agent nation, where the leadership is everywhere and the headquarters is Starbuck's. Like the very first open space meeting, it's all about the energy of a good coffee break, simple, powerful, working, learning, relaxing -- and exceedingly profitable. And finally, there is Chief Seattle, the invisible, spiritual leader of the environmental movement, to whom all kinds of wise sayings are attributed. Finally, if you step back for a moment, to the Evolution at Work table of contents, you see that the five sections of my own story flow through these same five levels. Opening Invitation (in organization) is about what had me so excited in the first place, about my own pioneering and discovering in open space. Inviting Evolution defined the body of this work, with mission, vision and values that include poetry and science, beginnings and endings, the personal and universal. Evolving Organization is the section we're in now, rational, logical, analytical, the strategic justification and business case for the inviting organization. Next, Organizing in Open Space introduces the soul of this work, where it all comes together, in practice, as inviting -- something we can do AND be, as individuals and organizations. The pieces there are built to travel as handouts, as the leaders of the practice become 'everybody.' Finally, the Opening Invitation (as organization) comes back to where we started, but knows the place for the first time. It's a last wisp of the spirit of (this) invitation to discover the inviting organization. And so we return to the Fast Company story that gave rise to this whole adventure. As a strategic question, "What business are you in?" certainly rests on the obvious, the essential, the matter of work. "What's your business model?" demands more of a body: set the boundaries, integrate the parts, make the case for what's in and what's out. "How digital are you?" is all about information, data, mind, and running the business by the numbers, which is where most of our organizations are now. But I wanted to know what the new leaders were doing now, not fifteen years ago. What is the NEXT great strategic question? Everything I've seen says it must be "How open and inviting is your organization?" The inviting organization emerges from everything and everywhere we've already been, and indeed still are. The emergence of passion, curiosity, health and well-being at work come not at the expense of excitement, security and achievement. They come as the fruits of it. The excitement comes not from the outside, but from the rush of bringing our own personal art to the outside, at work. The security comes not from knowing this job or organization will last, but from knowing who we are and that we have options beyond this one. And while we still get things done, we do them better than ever because they are the things we see as most important to do. Similarly, the emergence of strategic invitation and strategic conversation does not come at the expense of the strategic plan, but comes on top of it, animating and detailing it like never before. Every invitation, from the largest, company-wide strategic planning conference to the simplest "Joe and Susie are moving to California, come help us pack them up and send them off" gathering of friends is built on the same information: (1) the news, headlines or theme, (2) the mission, vision, values, and (3) the expectations and plans. In the case of Joe and Susie, the news is that they're moving. The values are love, friendship, community. The plan is for everyone to bring boxes and tape and for Joe and Susie to keep the pizza and beer coming until their stuff is all packed. The strategic corporate invitation does the same: some news that needs attention, the boundaries, budget, and other known constraints, and the logistical details for where and when the working session will be convened. The invitation includes all the levels of story below it, and transcends them as something smaller, faster, clearer, stronger. They look like soundbites, but move at the speed of the grapevine, with the simplicity of a to-do lisi and the power of the entire strategic plan. And as we move beyond the soundbites, the mission statements and the plans, posting their essences in strategic invitation and hosting our most important work in strategic conversations, we transcend command-and-control, as well. Command relies on the bartender, pilot, captain or other executive who can be heard over all the others. Control relies on measurement and constant observation. As we move beyond command-and-control into a world of post-and-host, we don't discard these things, we expand them. Over time, the initial cast grows into team, becomes bureaucracy, dissolves into network. When it finally blooms into marketplace, it allows EVERYONE to be heard over the turbulence of the work and demands that EVERYONE be paying attention to maximizing their own learning and contribution. In our most highly evolved organizations, ANYONE can post an invitation and host a working conversation to address business issues AS THEY ARISE and everyone can see all of the invitations, the entire work of their organization. Finally, as our work evolves, we don't stop making appearances and discovering new and different things, we don't stop making deliveries and making good on commitments, and don't stop expecting a return on investment. But the nature of these things changes and merges. Most notably, as our circles expand and bloom into marketplace, we notice that we benefit from all kinds of unexpected contributions by others. As this happens, we contribute more easily and actively because we don't expect our returns to come as quickly or directly. Our commitments become pledges to stay together, stay present, until the work is done, as long as it takes. And finally, the appearances we begin to invite and be excited by are no longer about our moments to shine, but those moments when spirit appears and shines through others. The inviting organization emerges and re-emerges out of personal passion and artistry, strategic invitation and conversation, an open community marketplace, and the responsible pursuit of learning and contribution. It is truly extraordinary, and not where most of us live and work everyday. But it does happen -- and happen with regularity. It has appeared in most of the Open Space meetings and events I've facilitated. And when the work of those gatherings closes, the waves of thank yous, amazings and extraordinaries have been heard, I always remind the group that while the inviting organization that emerges in open space IS extraordinary, it need not be rare. Indeed, the passion and responsibility, clarity and quickness that is the inviting organization can be invited easily and often, in Open Space and otherwise, by the intentional practice of invitation at work. This, then, is my own short story on Open Space Technology: It is the skillful and ongoing practice of invitation in organization. I say this not only because an open space event begins when the leader(s) of the organization issue a strategic invitation and open a strategic conversation, but also because of what can happen next, and next, and next... rippling through everything. When the leader(s) of any organization notice (and dare to say) that the most important questions facing the organization are more complex, diverse and urgent than the current systems and structures can handle, that there is some conflict between what we have and what we want, Open Space Technology allows them to invite and engage anyone and everyone who has any concern or responsibility for resolving these questions. When that first invitation goes out, it naturally attracts all of those with real passion for the issues identified. This IS what any good invitation does: it raises issues, stirs passions, and links them to responsibility for showing up to work. When the people gather on the day of the event, the facilitator walks into the open space in the center of the group (circle) and invites them again. This time the invitation is to identify the issues that they are most passionate about and for which they are willing to take some responsibility. Then any number of people jump out of their seats, grab markers and paper, and the next invitations go out. This time, however, the invitations come from all over the organization, from any of the participants in the room. These folks are inviting the rest of the group to their targeted breakout session to deal with the issue(s) that they see as most important. When the conveners (hosts, if you will) of the breakout sessions capture the notes, ideas and next steps identified in their sessions, they can be distributed in a book or website with the same from all of the other sessions. These collected notes invite all participants, and anyone else with whom these notes and next steps are shared, to follow-through on the actions identified. Often, some of those next steps include convening other meetings in open space. In this way, the practice of invitation comes full-circle, and sets itself up as an ongoing practice in organization. When new leaders emerge in open space, new invitations spring forth, and new results tend to follow -- people and organizations growing together, by invitation. In day-to-day organizational life, this identification of issues, assigning of responsibility, scheduling of meetings, discussion of options, and documentation of next steps all qualifies as "real work." In Open Space, however, so much of this real work happens so quickly and easily, that we often fail to notice how much real work is actually getting done. Indeed we often slip into measuring "real action" and "real work" in terms of pain and suffering rather than promise and progress. And, as ever, we'll get what we ask for. We could theorize that this new, inviting organization goes beyond command-and-control, to a place and practice of post-and-host -- the posting of working invitations and hosting of working conversations. We could reason further that while there is much to achieve in organization, nobody wants to BE an achievement. And while people want to BE inspired, as soon as we put "inspire the troops" on our to-do list, we flatten spirit into just another doing. Invitation begins to resolve all of this -- because invitating is something we can DO as an ongoing practice and can aspire to BE as leaders and organizations. In practice, however, we quickly discover that things tend to get done faster and easier by invitation. Working by invitation really works. And looking back, we see that nothing has been wasted. We've called it management flavor-of-the-month. Well, pick your favorite flavor and you're sure to find it on the map of our evolution, sure to find it contributing to the infrastructure that supports the emergence of open invitation at work. We've seen the emergence of "people goals" and "culture objectives" that give attention to the softer side of organization. Flexible schedules, open-book management, large-group meetings of all kinds have created new options, movement and markets within organization. We've seen all kinds of experiential team-building work, supporting both the rise and the fall of traditional leadership in organization. In our systems, we've seen technology explode into e-commerce marketplaces and knowledge management systems let everyone talk to everyone, even across time through the use of archiving functions. In the area of diversity, we have evolved from boundaries and glass ceilings as a focus, to quotas (diversity by the numbers), and now to various kinds of diversity training that helps organizations find valuable diversification rather than dangerous deviance in difference. The inviting organization rests upon and fully embraces all of our work to date, every flavor-of-the-month has been distance made good. Looking forward, with this clearer picture in hand, we can see how our journey can be that much more carefully directed and quickly actualized. We can see now how evolution calls us to balance our work in the four dimensions. Over-emphasizing finance or speed at the expense of clear cultural story and passionate, personal artistry can only throw our wheel out of balance. We can see ourselves rise and fall between the levels of evolution, not a steady, mechanical climb but a series of peak moments that we keep working and practicing to make ordinary, everyday, routine. We can see that what happens in Open Space meetings and events are such peak moments and that the practice of invitation -- doing AND being inviting -- makes more of them. And finally, we can see that in supporting this seeing, this story itself invites you to create it and reaches for the vision, the dream, that lies beyond. As I shared this picture with Harrison Owen one evening, it occured to me that in the physicists' story, matter arises out of nothingness, the void. And in the mystic's story, spirit returns us into it. When I added that blackness in the center AND at the edges, it immediately followed that I should fold the four blackended corners into the blackened center, so the whole thing becomes a sort of doughnut. In this way, our seasonal evolution through the four quadrants becomes a spinning around the empty hole of that doughnut. And our evolution through the levels becomes a turning of that doughnut through the hole of that doughnut. This realization gave me pause, a quiet little moment of personal "oh, wow!" Then into that silence, Harrison told me for years he'd had recurring dreams of such a doughnut, mysteriously spinning in space, around and through it's own hole...and that some years later a physicist friend of his explained that physicists call the doughnut a "torus" and know it as the shape of every energy field in Universe. So we just might be onto something that's quite a bit bigger than we expected. I find it reassuring to rest inside of a story that goes so far and can still inform my day-to-day work in organization. In a recent Open Space conference on management renewal, inside of a giant pharmaceutical corporation, a number of managers noticed that once the event got underway, I didn't seem to do very much at all. The usual comment as they approached was something like, "Boy, I wish I had YOUR job." And my usual response was to notice aloud that when we get our most important issues and projects posted on the wall, with a space and time for each one, the people get moving, the work gets done and management gets a whole lot easier. These kinds of Open Space events are inviting this kind of simple, powerful, productive ease -- in more and more major corporations, schools, churches and community organizations around the world. I find it incredibly hopeful that so many of these stories are emerging in Open Space and in the world. More and more, it seems that as we get better at bringing people together at work, it gets easier to get the job done. It gets easier to breathe, easier to sleep, easier to let go... and easier to do the most amazing things, at work. If we look around our world and our organizations, we see bits and pieces of this grand story everywhere. For me, it's comforting to know that there is some deep order underlying all of this day-to-day, project-to-project chaos. Now, if all of this mapping leaves you a bit blurry, give your head a good shake and get back out into the territory -- your "real" world -- but rest assured that your territory is all evolving in a big Open Space! And note that Open Space Technology is not only a nice "unstructured" way to "get things started." It's actually a highly evolved way of being in organization and getting things done. Which means that our work is to new structures that support it's ongoing practice, rather than simply piling more old hierarchical structures on top of it. In short, our job is to grow more of what's already working. For example, when Harrison Owen convened his first symposium on Organization Transformation, the participants all told him the best part of it all was the coffee breaks. So the next time around, he intentionally invited his participants to nothing more than one big coffee break -- and Open Space Technology was born. Intentional evolution, too, is all about seeing what's best in what we're already doing and working toward, naming it in a simple invitation, and opening the space for our colleagues, customers, suppliers, neighbors and friends, to work together, to create more and more of it. This is how I've come to understand and pursue what's best in organization: passion, vision, movement, effectiveness. This is the best I can do for now and I'm happy with how it's taken shape. At the same time, however, I know that this story -- and every other invitation, plan and map -- is flat. In every moment here, I choose but one word, where in fact, it would take many to tell the whole truth. I've tried to not write this story for more than a year, but I find that it won't go away, won't leave me in peace. Even so, every time I sit to write, I come face-to-face with the unfathomable odds against my getting it right -- getting it squeezed into the words that will allow you to understand what I'm understanding, in a way that you can use it in your life. Fact is, there are plenty of days when I can't even explain it to myself in the words I need, to know just what to do, at just the moment that I need to do it. Sometimes it happens anyway. I'd like to think it's a result of all the 'practicing' I do, in my mind, in those moments right after I should or could have done something very right. Perhaps the catch is that the moment of doing doesn't really need to be separate from the moment of seeing? But to not pull them apart is an awesome challenge, and who knows what might happen if my trust, my patience, my wisdom and compassion actually succeeded in leaving them together! So, this is a story that I could not not write -- a call I could not refuse -- and yet, one that I know is seeking a level of clarity and certainty that this written world just doesn't allow us humans; seeking a power that can only come when I sit with you and really listen to your story -- as you help me know it and then I tell you mine -- the two of us working together to find the words that lead us to us. And when it really works, writing this story of ours feels like a slow version of stepping up onto the top of a mountain, breathing the light of a sunrise, or inviting the smile of a little kid -- and saying "wow!" to nobody but myself -- before I can even really think it. It's a time of not doing anything and unavoidably doing something. It's about being powerfully connected to the whole and hopelessly alone in the details of my own understanding of it all; being driven to write even as I see what we really need is conversation you and me, us and them, more and more... about the things we care about most, are afraid we won't get or can't have, and yet must pursue. And all shall be well, as we post invitations and host conversations, marrying the personal and the strategic. It really does work! NOT because of our planning and efforting -- but because the world really is waiting for us, really is calling for us, to invite it into these conversations. The world is ever ready to create more of what works, more of what is best for all of us. With the map still fresh in our minds, we will toss it aside and get out into the territory of organization and the open space we live in. As we do, we give credit to Chris Corrigan, who first noticed that this map was indeed a useful tool for navigating this territory. By the time we reached Fairbanks to work together, he'd already been using it as a backpocket guide to "what's happening" during open space events. It was in looking around the city of Fairbanks, however, that I really started to understand the power of this little map, for understanding cultures, writing invitations, and directing movements in organization. Since then, I have used this map to sort out many many chaotic situations, cultures and moments. What follows here are a few of my favorites, where the map of evolution was used either to guide the writing of an OpenSpaceTechnology invitation or to make sense of "what's happening" (and what might happen next) in midst of Open Space. The City of Fairbanks, Alaska. This is a place where they call people from Anchorage and Juneau "wannabes" ...as in they "wannabe" real Alaskans, but they're not. The business district is dotted with steam pipes that vent the underground heating that makes running water possible in the central city. Parking lots have electric power for plugging in the cars and outside of town all the water has to be delivered to individual underground water tanks which also have electric heaters to keep the fill pipes thawed. As we drove around town, we crossed and recrossed the path of the Alaskan Oil Pipeline. And when we walked out behind our hosts house, we found mine shafts dug by miners who had come to stake their claim in the days of the goldrush. In short, looking around the Fairbanks landscape, the entire human story and local culture had everything to do with Energy, Power, Money, and the Peace of a vast untamed winter and wilderness. The Fairbanks Conference. How fitting, then that the first big event in Open Space in Fairbanks was the "Becoming A Peacemaker" conference sponsored by the Fairbanks school system and the Alaska Dispute Settlement Association. More important, however, is how the structure of the event really FIT with the culture of the place. Open Space is usually practiced in a 2.5-day format, with the last half-day set aside for "action" -- associated in our map with money, power, peace, etc. In Fairbanks, however, we did two days of Open Space conference and then ANOTHER two full days on action. Specifically, we did a training and practice workshop in which we had time to reflect on all that had happened and THEN plan a large number of followup meetings that would also be run in Open Space. So the practice got really grounded in that place. Peoria Neighborhoods. In the second training and practice workshop, in Peoria, Illinois, one participant was showing off the invitation from an event they'd done some years earlier. One thousand people had gathered to work on the "Future of Peoria's Neighborhoods." What was most interesting to me, however, was the little "tag line" at the top of this one-page invitation: "A Community-wide Forum and Call to Action." This was an event sponsored by the City of Peoria, so it was about the structure of neighborhoods. But it was also about the things that people had to do for themselves. So this tag line says, "We live together, but now we have to work together." We need to move beyond structure and get into action. The invitation was to take a giant step forward, from one season to another. Peoria Schools. We used a similar formula when inviting everyone who lived in Peoria School District #150 to come together in Open Space to work on "The Future of Education in Peoria." In this case, we specifically invited people to "create a vision that will be the foundation for moving forward together." We focused on the vision quadrant specifically because we did NOT want to invite a spontaneous community referendum on questions that were ultimately up to the School Board to decide in formal session. We invited visioning by the people that would be the basis for movement by the Board. In this way, we avoided raising expectations and threats to the formal sturctures and processes. Singapore as Trading Center. Some time later, I found myself running the training and practice workshop in Singapore. As I looked around the landscape of this place, the dominant shapes were the shipping lanes thick with ocean-going trading vessels, a massive investment in public housing (about 95% of the population lives in government-built high rise apartments) and public transportation, and considerable personal preoccupation with shopping, automobiles and education -- third quadrant all the way. Trading, marketplace, movement of goods, personal mobility, community, education. Of the perhaps two dozen workshops we've run around the world, this one stands out as the one in which participants were most hungry for "action." Clearly it is the next BIG question for this relative young national culture. Singapore Airlines. These folks are the world leaders in customer service, for years running. Even so, when I visited with them, they were in the process of a multi-year program they were calling "Transforming Customer Service." I didn't breathe a word to them about the four quadrant map, but as they told their story, it matched the seasonal evolution perfectly. When they started, they found that they spent the first year or so of the effort focusing on "purpose," specifically explaining why and what it was that they wanted to do this work. Then, they talked about the second year as "skills building" which I was afraid was skipping the second quadrant and leaping to the "learning" third quadrant. As they explained, however, it became clear that "skill building" meant "tearing up major sections of the old service manual" -- rewriting the story. Second quadrant, after all. Now, they said, the challenge was to "roll it out" (movement, third quadrant language). They were not yet clear about how to do this, because they recognized that most employees were still playing it safe and doing things the way they'd been mandated in the old manual. When we notice that the third quadrant is also the place of "community and support" it's clear that the invitation they were looking for was one that created the collegial, community support for individual, on-the-spot, not-necessarily-by-the-old-book, decision-making. Community Support for Individual Action. Ridgeview Medical Center. The American healthcare industry has been on the financial ropes for years so it is not surprising that this medical center's first entry into Open Space was on a financial question: "How Can We Find 50 More Days of Working Capital." They were short on cash and didn't want to take it out of the hides of the people doing the work, so they invited staff from all across the hospital to help find the needed resources. Clearly a fourth, finance, quadrant question. And, without any study of our map, they convened several other Open Space events to follow their first, financial success. The later sessions focused on "Patient-Centered Care." In other words, once they did their fourth quadrant warrior/finance work, they found their obvious next step was into the first quadrant space of the healer/caregiver. The Food Security Summit. In November, 2001, a large Chicago foundation invited all kinds of food producers and distributors, all activists of one kind or another, from organic farmers to food shelter volunteers, to come together and recognize the larger purpose of all their various work: healthy food for all. After the conference, a small group began working to structure a Food Policy Council, a structural response that could not really get underway until the larger community was able to "develop a common language." This common language, the common story, was the obvious theme for their next conference. Only after the development of that common language, could really structure and movement be supported. The Story of Open Space Technology. Finally, we come back to the story of OpenSpaceTechnology, itself. Springing from Harrison Owen's passion for transformation and written up as a professional paper, it evolved into a traditional professional learning conference structure. That soon dissolved into the first Open Space Technology event, when Harrison wanted to make the business of it a lot easier. So far, that's purpose/passion into vision/story into structure/learning into ease/power. For years, people worked on that original purpose of Organization Transformation. Then, as they started using Open Space with their clients, by accident and experiment more than by plan, the stories they told started to shift from the purpose of transformation to the places where it was working, the directions it was leading, and the visions they were developing for the "Open Space Organization." More recently, the conversations have migrated to an email listserve and have been more and more about the structuring of events and hybrids with other methods. Then last year, after doing work with a number of Isreali and Palestinian groups, Harrison has come back and propopsed OpenSpaceTechnology as the Practice of Peace. And so we click forward from the purpose of transformation, to visions of Open Space, to the alternatives for structuring OpenSpaceTechnology, and finally to the action, the practice, and the peace that is the pay-off. In all of these situations, this relatively simple map (InvitingOrganizationEmerges) gives me the confidence to venture out into Open Space, helps me make sense of what I see happening, and gives me clues about what might be most easily invited next. This is the first update here since the original was posted in 1998, and an addendum in 2002 or so. I've rolled the old addendum into the story above and offer the following new stories that are emerging from the Agile software development community. These four "values" and an accompanying set of twelve "principles" have revolutionized much, but certainly not all, of the software industry. They point in the direction of self-managed teams, the sam sort of structure that Emery and Trist were pioneering in the 1960's, which is to say, evolution is a long game. Indeed, a whole industry, ironically rife with processes and tools, has grown up around the challenges of transforming IT divisions and whole enterprises into Agile operations. Agile has become big business and the path of Agile adoption is generally assumed to be long and difficult. So what happens when Agile adoption runs on invitation and self-organization, more like Open Space? Walmart's experience is telling, impressive, and directly informed by this story of the Inviting Organization, through my colleague Daniel Mezick's book on [OpenSpace Agility]. Walmart has 2.3 million employees. In their technology division, they have 4000 core employees, and another 6000 contractors — and just four agile coaches. (Agile coaches in most other firms will work with just a few teams, generally not more than 50 or 100 members, total). Even so, Walmart has gone from 10% Agile to 80%+ Agile in about 1.5 years. They don’t mandate methods or tools. Teams choose Scrum, XP, Kanban, SAFe, etc. and use a variety of project management and tracking tools. They’ve done 30 open space meetings for 300+ people each in about 8 months. Until late 2015, they considered Open Space such an important competitive advantage that they did not speak about it publicly. When I first talked with one of their coaches in an Agile learning group, he shared that his SVP keeps asking him “what does the agile store look like?” (They have 11,000 stores). I sketched him a back-of-the-envelope, invitation-based, open space plan to touch all 11,000 stores in a year. He thinks it might take five. Probably we have slightly different "definitions of done." Either way, Agile in Open Space looks fast and effective, in IT and beyond. And, of course, this same approach would work with any other enterprise-wide transformation. In 1998, the original map and story focused on articulating "How Inviting?" as the "next strategic question." The Walmart story, social media, and [other platforms] seem to validate that. 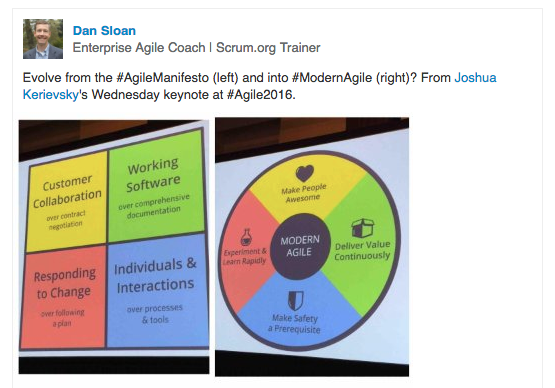 Looking back, the Agile Manifesto itself was a sort of invitation to developers to focus on people rather than tools, to work more directly with customers, to start building sooner, and to be more responsive to changes. Now that this story is fifteen or twenty years old, what's the next "next strategic question?" 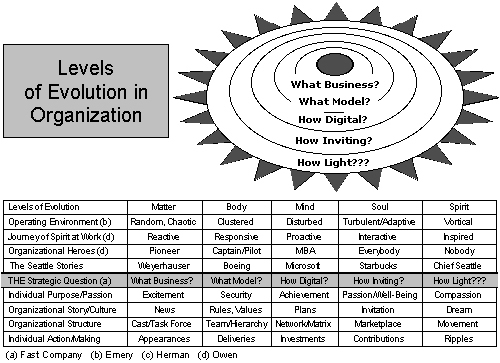 As seen in the map above, I suggested the fifth level question might be "How Light is your Organization?" As I've explained elsewhere, the reasoning is that at this highest level, analogous to Fred and Merrelyn Emery's vortical environment, everything swirls together. This level is peak or ideal more than sustainable and achievable. It's what we aspire to be more often than what we actually do. Beyond any one quadrant or dimension, the essence of the experience is that it's all happening at once. We're doing it all, being it all, working all quadrants, simultaneously. "How Light?" captures this in the sense that light is love, light is clear, light is fast, and light is easy (or powerful, what I called effortless impact in the original map). I think this Light may have just dawned at the Agile 2016 annual conference, in Atlanta. Make People Awesome seems less about People than Awesome. This is an invitation to tell Awesome stories, to be bold and clear. Learn Rapidly maps directly to the third quadrant above, but adds the explicit invitation to Experiment. Deliver Value Continuously implies and requires that teams and organizations make it easier and easier to make changes, to deliver value. I understand that some of Josh's words, like safety and experiment, have a history in software that might be useful. Why do I like these alternatives better? Kindness and Care seem more positive and proactive than Safe. Awesome stories give better vision and direction than Awesome characters. Testing Limiting Assumptions refers to experiments (tests) but also to dialogue, the flow of meaning and the practice of suspending and examining assumptions rather than holdinig them close, defending and resisting. Finally, Making Delivering Value Easier is made more accessible by dropping the judgment implied by Continuous. When these flow together in practice, we take many, careful, clear, quick, easy steps, delivering value in the direction of continuous flow. We work lighter and lighter - with more and more love, clarity, speed, and power. In his talk, Josh told a number of stories to illustrate each one of these four dimensions, one quadrant at a time. The nature of vortex, flow, peak and light, however, suggests that they might be more awesome and effective if we hold up each separate success, noticing where each dimension is active and inspiring within it. The important thing about where we're going is that more and more it all happens at once, or it doesn't happen at all. This simultaneity, this inseparability of the inner and outer, personal and collective experience is what make these peak experiences and inspiring success stories peaks and inspiring. Think about your own most important and exciting and powerful success stories and see if love, clarity, flow, and power or ease don't jump right out of them. Earlier this year, a friend and colleague's Dad died suddenly. His Mom was understandably overwhelmed by all the different things that needed to be taken care of. A practicing agilist, my friend instinctively got out the stickies and put everything on a task board. As he was leaving that day, he mentioned that he wouldn't be able to come back the next day. "But what will I do?" she asked. "Well, Mom, look at the board..." he says. "Oh, well, I could do this one... and this one..." Love, check. Clarity, check. Momentum, if not speed, check. Powerful, for sure. We do these practices when things are easy or otherwise going our way, so that we have them when things get difficult. We do invitation as a technical practice. And we aspire to be inviting. It's not that any one level or quadrant or method is better or more important that the others. It's the going back and forth, up and down, inside and out, personally and collectively, that strengthens us, and makes us more and more agile, and effective, over time. The value of opening space and inviting, as practices, is that it takes us right up to the edge, in a sustainable way, to a base (camp) of sorts, and keeps us ready, within reach of the peaks. "We shall not cease from exploration | And the end of all our exploring Will be to arrive where we started, And know the place for the first time." (T. S. Eliot, Four Quartets) What I hear Josh and Modern Agile suggesting is that after 20 years of exploring "lightweight" methods (and some not so lightweight), in the software development community, we may now be closing in where we started, challenged to make IT and the whole enterprise light again, with a fresh, new understanding of what makes work Light. Interestingly enough, [Carrie Kish], author of Tribal Leadership and the last of the three keynote speakers at Agile 2016, presented "the five stages" of culture. Like the evolution above, she says culture moves up and down this spectrum (rather than a rigid, one-way, linear climb) and that the highest of her stages has the same fleeting, peak experience quality as the vortical, spirit, fifth level I've described. She finished with four questions to guide moment-to-moment conversation and action. Organization as Light. Life is Great. High ideals, and yet, it's quite possible to notice that nothing important and valuable happens, in teams and organization, without caring, clarity, flow and power. If that's too strong a claim for you, then certainly it's possible to look at the most important and valuable results and notice that these dimensions of Light are all, and always, present and inseparable, from each other. Great kindnesses make Awesome stories. Awesome stories beg to be be tested, and bested. Experiments deliver value, even when they fail. And success makes it easier to be kind. What's more, what's easy, is that when we do any one of these four at a high-ish level, the others tend to show up. So where to start? Simply invite more Kindness, Awesomeness, Experimentation, or Value. Huddle up with any team and ask Carrie Kish's four questions, if you like. But notice that the easiest way to invite any of these is to BE them, yourself. Of course, you already are and do these things! (Sometimes we map caring to heart, stories to brain, conception to pelvis, and power to legs.) The good news is that Open Space and Agile call us to be more and more of who we already are. The bad news is that ease and simplicity are often quite difficult. This evolution game is long, won by a messy series of many, many careful, clear moves in the general direction of greater ease and value. But we need to make those moves, and win this game, together. Territory? Vast. Darkness? Yep. Light? Us!